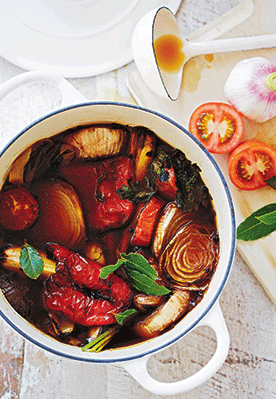 A stock with a savoury flavour punch is the key foundation for scrumptious soups, especially delicate summer soups. Use top-quality veg and be bold with healing seasonings. 2. Put all the vegetables in a roasting pan and splash with the olive oil, tossing to coat. Roast for 45 minutes, stirring often. You may have to remove the vegetables that cook faster as they are ready. 3. Once all the vegetables are cooked, transfer them to a large stockpot or flameproof casserole dish over medium heat on the stovetop. Add the herbs, peppercorns and apple cider vinegar, then add filtered water to cover and bring to the boil. 4. Reduce the heat to low and simmer for 1 hour. 5. Strain through a muslin (cheesecloth) lined sieve, store in an airtight container in the fridge and use as needed.